In a series of providing practice questions for Data Interpretation section, today I am providing double diagram practice questions set. 1) The number of persons who died in train accidents in 2013 is how much percent more than the number of persons who died in the train accident in 2011? 2) What is the average of the number of persons who died in train accidents in 2008 in all states together? 3) In which state is the number of persons who died in the train accidents the maximum during the given period? 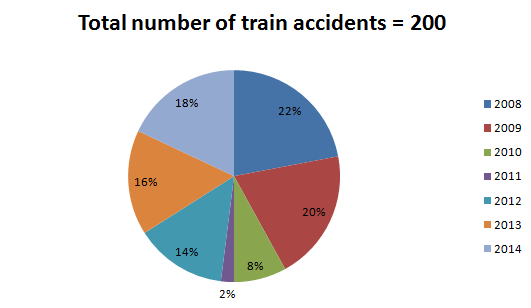 4) What is the difference between the number of train accidents in 2014 and that in 2012? 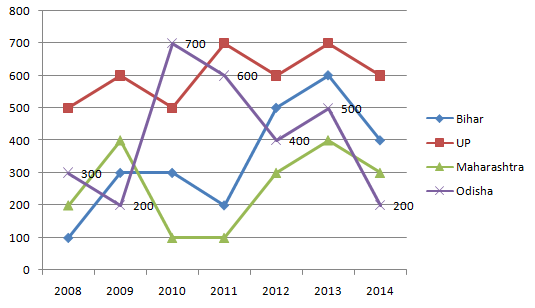 5) What is the ratio of the number of persons who died in train accidents in 2010 to that in 2014? Study the given bar graph and pie chart to answer the following questions. The bar graph shows the production (in thousand tones) of Wheat, Rice and Maize in different states. The pie-chart shows the percentage of agricultural land in the given six states. 6) The productivity of which state is the maximum? 7) The production of which state is the maximum? 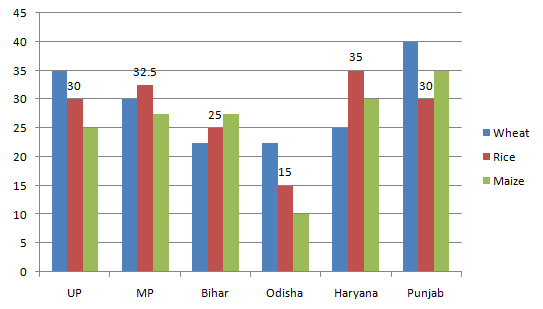 8) The production of wheat in Punjab is what percent more than the production of Maize in Odisha? 9) What is the ratio of the production of Rice in Bihar to the production of Wheat in Haryana? 10) If MP exports 40% of Rice at the rate of Rs.30 per kg and UP exports 30% of Rice at the rate of Rs.32 per kg, then what is the ratio of the incomes from the exports? In UP the number of people who died in train accidents is the maximum. Quicker method it is clear from the graph that the highest number of people died in UP.